Jungle Boogie Classic Slot Guide & Review - Casino Answers! 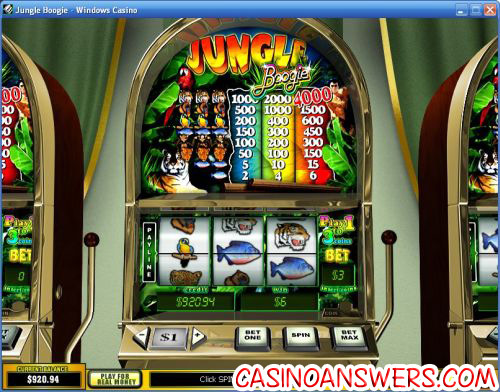 Jungle Boogie is a 3-reel, 1-payline classic slot machine developed by the Playtech online casino software providers. You can play Jungle Boogie at Casino Del Rio and William Hill Casino. To play the Jungle Boogie slot, set your coin size at $0.05, $0.10, $0.25, $0.50, $1, $2 or $5. Then you can hit “Bet One” for the number of coins you want (up to 3), followed by the “Spin” button. Alternatively, you can use “Bet Max” to play all three coins. The level also works the same as the “Spin” button, so it not just there for show. The minimum bet on the Jungle Boogie slot machine is $0.05, while the maximum is $15 per spin. The top jackpot on the Jungle Boogie slot is the Tiger symbol. 3 Tiger symbols on the center payline will get you a win of 4000 coins. The second highest symbol is the Baboon symbol at 1500 coins on 3-coin payouts, but the 2-coin payout for the Tiger symbol is still worth more than that at 2000 coins, making the Tiger symbol easily the most desired symbol in Jungle Boogie. There are a total of eight winning combinations in Jungle Boogie. Payouts on the Jungle Boogie classic slot machine are as follows (1/2/3 coin payouts in parenthesis): 1 Fish symbol (2/4/6), 2 Fish symbols (5/10/15), 3 Leopard symbols (50/100/150), 3 Chimpanzee symbols (100/200/300), 3 Fish symbols (150/300/450), 3 Parrot symbols (200/400/600), 3 Baboon symbols (500/1000/1500) and 3 Tiger symbols (1000/2000/4000). Click the “Menu” button followed by the “Autoplay” button to access Jungle Boogie’s autoplay feature. In simple mode, you can set the number of autoplay spins up to 9999. Use the arrows on the left to expand the autoplay feature into advanced mode where you can set it to stop on jackpot win, on a single win and when the balance gets to too high or too low. You can also set the delay between spins. Jungle Boogie’s autoplay feature is fully customizable and allows you to input your own values. Hit the Play symbol to start the autoplay spins, pause button to pause or “X” button to stop. If you want to try Jungle Boogie, you can get a 100% up to $600 signup bonus to play it and nearly 200 other games at Casino Del Rio. If you’re an environmentalist or are someone who is concerned about the environment on any level, as an added bonus, Casino Del Rio will plant a tree for every new real money player they get! So not only can you play some fun online casino games, but you can also be helping to save the environment in a small way when you sign up, deposit and play at Casino Del Rio! Are USA players able to play Jungle Boogie for real money? Unfortunately, Playtech casinos such as Casino Del Rio are unable to accept deposits from USA casino players at this time. Instead, we recommend you visit Slotastic Casino for many similar slot machines and video slots. Is it necessary that I download casino software to play the Jungle Boogie slot game? No, Casino Del Rio offers a no download casino, perfect for Macintosh online casino players. If you experience any problems trying to play the Jungle Boogie flash slot game on your computer, try downloading the latest version of Adobe Flash Player. Where to play the Jungle Boogie Slot Machine?